Founded in early 2000, Inosym's entry into the wire and cable market has been rapid. From humble beginnings - Inosym is today one of the key players in the supply of wire and cable products to industries all over the world. Our rapid expansion has allowed us to develop an extensive supply and distribution network and today - our quality products are exported to Asia, Europe, North America, and South America. Furthermore, we are able to maintain and adhere to strict quality standards so that the performance and durability of our products are always assured. Inosym, world wide suppliers of Steel and Plastic Reels will again be exhibiting at the Interwire show. Inosym will have on display a range of Steel and Plastic reels to show case our production capabilities and quality. Our team welcomes the opportunity to talk to our customers about some of the new technology we have introduced into our manufacturing plant and how this can benefit the wire and cable manufacturer. This includes robotic welding and automated painting. Inosym are sure you will find their quality, performance and price to be world class. Inosym, world wide suppliers of Steel and Plastic Reels be exhibiting at the wire 2016 in Dusseldorf, Germany from April 4-8, 2016. Inosym will have on display a range of reels showcasing design flexibility and quality. We welcome existing and new customers to come and discuss your reel requirements for 2016 and meet the Inosym team. Inosym has been supplying reels to the cable and wire industry for 13 years and to over 55 countries. Specialising in Steel and Plastic reels that are manufactured to European and USA standards, Inosym can offer reels to meet all the varying needs of the modern manufacturing plants. Inosym is committed to providing our customers with world class quality reels and bobbins at competitive prices. Inosym reels were developed to provide cable and wire manufacturers with a product that was realistically priced and of high quality. We believe we are achieving this and are assisting our customers to reduce capital expenditure and increase profits. Inosym is now supplying customers worldwide with shipping and process reels that are shipped unassembled, and assembled on the customer sites saving freight and storage costs. For reels having a flange size over 1600mm there are significant cost savings with the added benefit of steel being stronger and more environmentally friendly when compared to plastic. Inosym, which has become one of the key players in the supply of wire and cable products to industries, welcomes your inquiries. The company, founded in early 2000, exports its drums and reels for wire, cable, rope and strand to Asia, Europe, North America, and South America. ABS plastic reels from 250mm to 1000mm for insulating, group twinners, stranding, bunching, jacketing. MF (Metal Flange) pressed metal process reels come in sizes from 100–1250 mm and are made from high-quality steel plate and tube. Applications include universal take-up and payoff reels, bunching, stranding, insulating and jacketing. SM (Semi Machined) double-wall high-speed reels come in sizes from 315–1250 mm and are made of high-quality steel plate and tube. Applications include drawing, bunching, stranding and insulating. FM (Fully Machined) steel high-speed reels in sizes ranging from 100– 1000 mm and manufactured from high-quality steel plate and tube. Applications include high-speed single-wire drawing, high-speed multi-wire drawing, bunching and enamelled wire coating. SD (Steel Drum Reels) are large steel process and shipping drums available in sizes ranging from 800 to 4500 mm. SD Steel Drum Reel options include flat sided flanges, corrugated flange and break-down reels. Applications include drum twisting, stranding, insulating and jacketing. With more than 40,000 square meters of production space, Inosym can provide our customers with rapid delivery of both large and small reel orders. Inosym are sure you will find the quality, performance and price to be world class. We look forward to welcoming you to our booth in Hall 11 stand D58. establishment of a Joint Venture company. IQ REELS. The establishment of IQ reels is a major mile stone for Inosym and Qunye and will ensure existing and new customers continue to receive high quality products and service through a comprehensive world wide professional sales network and world class production facilities of over 40,000 square meters. The forming of IQ reels will ensure the continued sales growth of the brands Inosym and Qunye and drive IQ REELS to becoming the supplier of choice of reels to the cable and wire markets world wide. The quality and service of Inosym combined with the cost base and production facilities of Qunye will allow IQ reels to offer reels, bobbins and spools to meet all markets quality and price expectations. We are excited by the benefits this presents our customers in terms of quality, delivery time and price. Inosym shipped our largest reels in Dec 2009 to Egypt and Malaysia. The reels were SD4000mm and SD3600mm. It was a great achievement for our engineering and logistics teams. 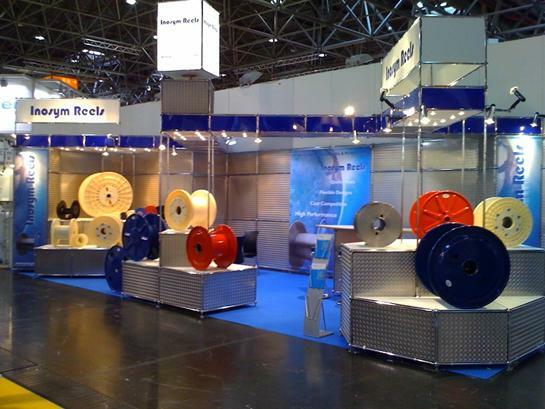 Inosym, world wide suppliers of Steel and Plastic Reels exibited at Wire Dusseldorf 2012. Inosym displayed a range of reels including the new breakdown plastic shipping reels. Inosym welcomed existing and new customers and discussed their reel requirements for 2012 and meet the Inosym team. Services Overview We supply various reels and drums worldwide. Inosym can offer Reels and Drums to DIN specification or as per customer specific designs. Please contact us to request information for our products at Inosym Ltd.